DVI is a standard for digital and analogue picture transmissions between e.g. computers, screens and projectors. 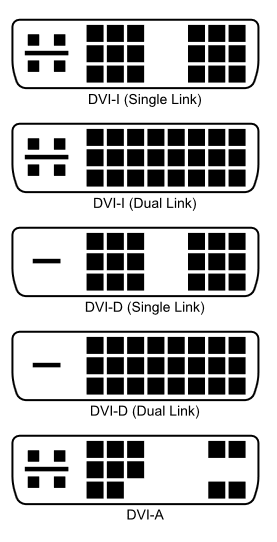 According to the picuture to the right below, there are some different standards, depending on the requirement of the interconnection. DVI Dual-link support 3D and defines input/output protocols for the major 3D video formats, paving the way for true 3D gaming and 3D home cinema applications. SUPRA HD7 high performance DVI dual link cable is specially designed for digital high bandwidth transfer up to 30 meters. Screen resolutions as below for the new up-coming generation of > 27 inch screens, set new standards of both picture quality and cable design. The HD7 and HD5 cable conductors are insulated with air-injected PE foam for lowest capacitance and highest velocity factor (0.8 x speed of light) giving digital square wave rise time very close to the ideal; from 0 to 1 and back again instantly. The digital pairs have a precise and stable impedance over all working frequencies a property crucial in any digital circuit for not causing jitter. Individual screened pairs are twisted with different directions of the pitches in order to minimise crosstalk. The cables are triple-shielded, the most sensitive conductors are separately screened. In addition, all conductors are protected with a common, double shield of aluminized PET foil and 5N purity copper braid, which provides highly efficient shielding from electromagnetic interference (EMI, RFI). The cables are equipped with 24K gold plated connectors and a fully shielded contact housing made of aluminium to further avoid signal degradation. The connector is re-wireable to enable mounting after cable installation in walls or conduits, tubing, trunking, etc. Since the contact housing is possible to disassemble, the DVI contact body is possible to route in a large enough conduit provided that the fragile leads kan be covered and NO traction force is applied to the contact housing itself. The gold plating of the pins is as thick as 0.8 microns for long service life connection quality also with frequent re-connections.